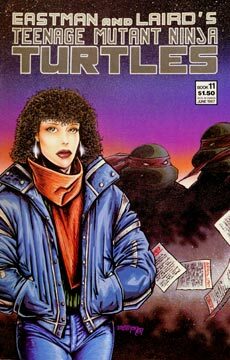 The issue opens with April having nightmares about being attacked by ninja monsters who look similar to the Turtles and Shredder. April wakes up screaming and then heads off to write in her diary. The diary becomes the framework for this issue, and the means by which we learn of our heroes problems since they were attacked by the Foot and lost all that they held dear. April begins the tale by writing how she arrived in Northampton and her less than enthusiastic reaction to both the small New England town and Casey’s grandmother’s farm house, where our heroes will be spending the winter. The farm has been abandoned for four years and is quite a mess, and while Casey is excited to be there, April is not. April then writes about Leonardo’s condition. While Leo has healed physically, the stress of being beaten so badly by Shredder and the Foot is wearing hard on his psyche. He’s taken to hunting in the woods alone, and we see a scene where Leo has a skirmish with a large buck. Leo is knocked down by the deer and he sits dejectedly in the snow, looking utterly defeated. April then writes about Donatello, who is working obsessively on repairing the homestead. Don fixes the windmill, uses a water wheel to generate electricity, hooks up a wood stove for heat and manages to get the hot water heater working. April is surprised to find that Don is also writing, tapping away on an old typewriter in the attic. April wonders what Donatello is writing about. We see Don looking out of a window, a huge pile of crumpled paper overflowing his waste paper basket. Michaelangelo’s story is next. It seems that Mike has lost his sense of humor and spends most of his time practicing in intense, almost maniacal workouts. April sees Mikey destroy a work bench and punch holes through the barn. It seems everyone is suffering tremendously under the strain of recent events. Raph is keeping to himself, the first up in the morning and the last to bed. We see the fiery ninja on the roof of the barn late at night, keeping a steadfast watch. April describes Casey, “I believe that in Casey’s mind there’s a petulant, mischievous ten year old waging constant war with a somewhat mature, bright young man… unfortunately the ten year old wins far too often.” We then see Case and Raph working on an old truck while they trade insults with one another. With Raph behind the wheel, the lads manage to get the vehicle going, but unfortunately the truck careens out of control thanks to the snow. Raphael accidentally pilots the truck into Don’s windmill, destroying it, and then the frantic Turtle crashes the vehicle itself into a ditch. The accidents don’t stop Casey and Raph’s insult contest. We then cut to a scene where April is walking on ice, which cracks open. Miss O’Neil screams and falls into the icy waters. Luckily Leonardo is hunting nearby and comes to her rescue. Leo uses his katana and cloak to make a lifeline and pulls April out of the cold depths, and then carries her home. Inside the farm house we find April is sitting unconcious but snug in a chair with a blanket and hot water tub for her feet, surrounded by the Turtles and Splinter. Master Splinter announces that it’s time for the Turtles to get busy, as their spirits have drifted for too long. With the oncoming Spring, the Sensei puts the team back to work, training together once again. Finally we see the sun rising over the horizon and zoom into the farmhouse, where April lies sleeping. There’s a knock on the door and April sits up alarmed. The final page shows the Turtles bringing their friend breakfast in bed. Life is good… and life goes on.